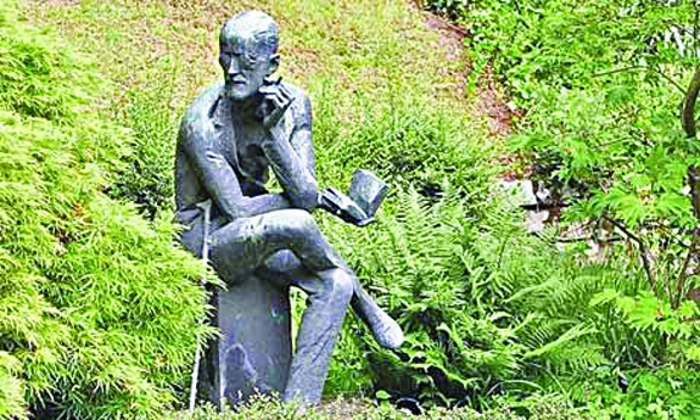 The distinctive sculpture of James Joyce by Milton Hebald, marks the Joyces’ grave at the Fluntern Cemetery, in Zurich. On a late afternoon last August, my friend John Hill drove me across the city of Zurich, climbing the suburban heights until we stopped at the gates of Fluntern Cemetery. We walked up the last incline to where, among the trees and billard-table lawns, we saw the Joyces’ grave. There was no mistaking it. Just above the grave is the Giacometti-like sculpture of the writer himself, the work of American artist Milton Hebald. There James Joyce sits, in characteristic pose, deep in conversation, head tilted, one leg resting on the other knee, cigarette poised, his slim cane delicately balanced. Someone once remarked that he held his cane like a musical instrument. Buried with him are his son Giorgio and Giorgio’s second wife, and of course Nora, that courageous Galway girl who, at the age of 20 years, followed her star. On October 8 1904, beguiled by his wonderful talk, good looks, and great plans, she ran away to Europe with a penniless James Joyce only two years older than herself. Sometimes it is easy to picture the young Nora Barnacle running through the lanes of Galway at the end of the19th century. She went to school at the Presentation Convent. The nuns must have thought a lot of her because later on she worked in the convent’s little gate lodge. She was high spirited. She once dressed as a boy, and strolled around the town, no doubt thoroughly enjoying herself. She was very attractive with long auburn hair. She had several boyfriends, including a Protestant boy, William Mulvagh, which earned her such a thrashing from her uncle Tim Healy, that she ran away to Dublin. Some weeks later a cocky James Joyce stopped her in the street, and began chatting her up. He asked her out for a date. She agreed. But she didn’t turn up. He wrote begging for a second chance, and on June 16 1904 she turned up. The two young people walked out to Ringsend to a quiet place for a court. They were together for the next 32 years. Despite a very challenging life Nora coped remarkably well. She came from a small town in the west of Ireland, yet quickly adapted to their nomadic and cosmopolitan lifestyle. She later admitted that being married to a writer was a ‘difficult life’ (they did not actually get married until July 4 1931 ). They had two children early on in their relationship, Giorgio and Lucia, whom they raised on the indifferent wages earned by Joyce teaching English, and by her taking in laundry. She tolerated her husband’s brief infatuations with other women, and did her best to manage his erratic behaviour and drinking binges. Once she threatened that if he didn’t stop drinking she would have the children baptised! She endured his obsessive jealousy over her former lovers, and learned fluent Italian and German. She spoke French with some hesitancy. She appeared in plays that Joyce organised in Zurich during their first sojourn there, taking shelter during World War I. She was highly praised for her role as Cathleen in Riders to the Sea (June 17 1918 ). She was happiest in Paris, where they spent most of their lives. Her husband was lionised there; and they enjoyed some financial security. Nora loved glamorous clothes, having her photograph taken, and the opera. Of all the mad, tumbling words Joyce used to describe his passion for her in his intimate letters, he also called her ‘my beautiful wild flower of the hedges’. She inspired his famous fictional women: Gretta Conroy, Molly Bloom and Anna Livia Plurabelle. The most eloquent tribute paid by Joyce to Nora was to set the date for his day-long masterpiece Ulysses on June 16 the same day he and Nora first walked out together. It is affectionally known as Bloomsday today. And then another war, and a second refuge sought in Switzerland. In December 1940, Joyce and Nora, with their son Giorgio and their grandson Stephen, arrived exhausted in Zurich after considerable difficulty gaining the appropriate papers from the German and Swiss authorities. To their deep regret they had left behind their daughter Lucia in a psychiatric hospital in Brittany (they believed that they could get her to follow them once they were settled ). * But barely two months later, January 13 1941, Joyce suddenly died following complications arising from a stomach ulcer. Nora was devastated. During the short burial service ‘ she remained erect and dry-eyed’, watching as the coffin was lowered into the grave. For a moment Joyce’s face was visible through the small vitrine in the coffin lid. She suddenly cried out: “ Jim, how beautiful you are!” She had gone to considerable trouble to have a wreath made of green leaves in the shape of a harp. “Per il mio Jim che amava tanto la musica” (I chose this for my Jim who so loved music ). On that August afternoon last year, my friend and I listened to see if we could hear lions roar. No. But we did hear the sounds of wild birds, or was it monkeys? screeching. I placed a small bouquet of summer flowers, which I had picked in Galway earlier that morning, on her name. NOTES: * In 1951 Lucia, who outlived her family, was transferred to St Andrews Hospital, Northamptonshire, where she died in 1982 at 75 years old. She is buried at nearby Kingsthorpe Cemetery. - It is unfortunate that the Barnacle family home, in Bowling Green, where Nora spent her very early years, and which was lovingly restored by Sheila and Mary Gallagher, is still closed. It costs money, but only a modest amount, to reopen it, and to have a guide present during the day. It was visited, by Joyce and the children in 1912; and later again by Nora and her children. It was brave of Joyce to arrive at the Barnacle home considering that he had run off with their daughter, but they adored him. It is one of Galway’s heritage treasures. Surely there must be a way to show ourselves and our visitors how proud we are of Nora.